The Life & Loves of Lolly : The MADs Blog Awards 2016. I've been nominated! Yesterday was just a normal day, a day at home with Joey and doing a few jobs. All very normal until I checked my twitter feed and found out that I am one of the nominees for MADs Blog Awards Blog of the Year 2016. The blog will be 2 years old in September, this is the first time my blog has been recognised and I am so so excited! 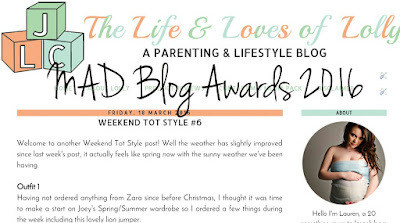 If your not familiar with the MADs BLOG Awards The Mum and Dad (MAD) Blog Awards they are the biggest and most exciting awards for parent blogs in the UK. The Life & Loves of Lolly has been nominated in the Blog of the Year category, we're up against so many amazing blogs that I'm not expecting to get very far when being so new to the blogging world. I started the blog as just a little hobby after I got made redundant in 2014, 3 months into my maternity leave. I've always loved writing and expressing my thoughts and opinions. I've documented a lot of Joey's life on here and talked about sensitive issues that I hope can help people. I get so excited about my blog and all the love it receives. I'm so honoured to work with some great brands which is just one of the many amazing things my blog has allowed me to do. As a new blogger I'm still making mistakes but that's all part of the process and allows me to improve. You can vote here at MAD Blog Awards 2016, you'll just need to input the blog url which is http://www.thelifeandlovesoflolly.co.uk. Thank you to all my readers and supporters and good luck to all fellow bloggers.